Anti wrinkle and anti fatigue action. 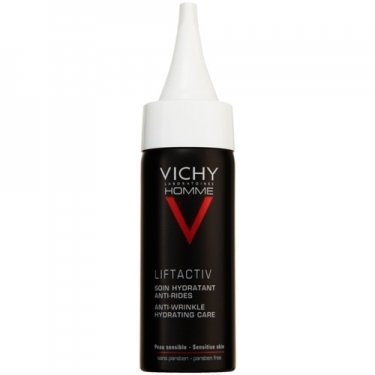 DESCRIPTION: Homme Liftactiv Soin Hydratant Anti-Rides from Vichy is an anti age and anti fatigue care for men with sensitive skin. 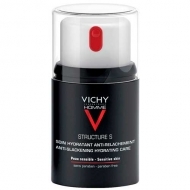 Formulated with Hyaluronic Acid and AHA, fills wrinkles, revitalizes and brightens the skin. Fresh texture of tensor effect, provides intense hydration for 24 hours. Hypoallergenic. Visible results from the first application. * Skin is instantly more luminous and smooth: 98%. In 8 days: -12% of deep wrinkles. ** In a month, the skin becomes visibly younger and revitalized: 87%. * Self-assessments in 53 men. ** Test instrument over the length of the wrinkles on 52 men. Apply morning and/or evening on cleansed face. It can be used after shaving.